David Fisher lines up a putt, scoring a team-high 45 in Albia’s first home meet on Thursday. Tein Thiravong hits a shot off a drive in Thursday’s home opener. Thiravong shot a 48 for fourth best on the team. 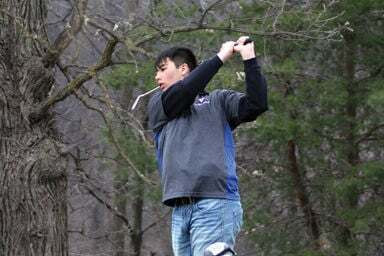 The Blue Demon golf team claimed a victory in their first home meet on Thursday shooting a team 188 followed by SCC rivals Chariton (222) and Clarke County (196) as well as Moravia (194). Ian Flahvie and Gage Wilson struggled a little today with both golfers shooting 51's. Freshmen Garin Grinstead shot 59 in his golfing debut. Zach Schwarte carded a 69 and Caelan Robinson parred his second hole in a meet and ended with a 79. The Blue Demons are in action on Monday at Davis County and then at home for the Albia Invite on Tuesday. 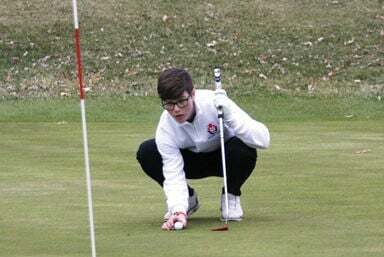 The Albia High School boys’ golf team scored another victory at the Davis County Triangular on Monday night coming in with a team score of 188 while SCC rivals Chariton shot 193 and Davis County 196. Not far behind Kosman were fellow senior Dawson Hermsen and junior Ian Flahive, both shooting 46. “Dawson has scored in the top four every meet so far and I know he is capable of doing even better,” said Coach Hermsen. “Ian Flahive bounced back after a poor showing at home on Thursday. We need both of these guys to keep stepping up and playing even better if we are to have a shot at the SCC Championship.” Also scoring for the Blue Demons was Zach Jones carding a 49. Chase Maddison and Tein Thiravong struggled on the day, each shooting a disappointing 52. David Fisher was thrown into the number one spot and didn't play as well this outing shooting a 54. “All three of these guys are capable of scoring better than this,” said Coach Hermsen. “I expect them to come out on Tuesday and play better.” Freshmen Garin Grinstead improved to shoot a 54. “I have been impressed with Garin and how well he is picking up the game of golf,” said the coach. Zach Schwarte shot 71 followed closely by Caelan Robinson with a 73. Albia will be on their home course on Tuesday. “I am happy to win especially on the road but we need to get our scores lower to have a chance for the conference title. Every guy needs to work on being more consistent with their chipping and putting,” said Coach Hermsen.